DVD01 is a 2017 Treasure Hunt and 3/10 in the Tooned series. The yellow muscle car has a black stripe on the top and sides. 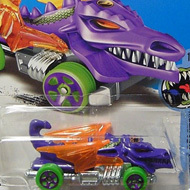 The Hot Wheels logo, “69”, and the low production symbol also appear on the sides. It has tinted windows, a chrome interior, 5-spoke wheels with gold rims, and a black plastic Malaysia base. The car made its debut in the 2004 First Editions as the ‘Tooned ’69 Camaro Z28. This cartoony version of the actual vehicle has an oversized engine and large side exhausts.